WASHINGTON, March 15, 2018 /PRNewswire/ — New Orb Media research and reporting shows that a single liter of bottled water can contain thousands of microplastic particles. Exclusive tests on more than 250 bottles from 11 leading brands worldwide reveal widespread contamination with plastic debris including polypropylene, nylon, and polyethylene terephthalate (PET). Plastic was identified in 93 percent of the samples. The global average was 325 particles per liter. Particle concentration ranged from zero to more than 10,000 likely plastic particles in a single bottle. The study was supervised by Dr. Sherri Mason, Chair of the Department of Geology and Environmental Sciences at the State University of New York at Fredonia, a leading microplastics researcher. What this means for human health is unknown. Brands tested included Aqua (Danone), Aquafina (PepsiCo), Bisleri (Bisleri International), Dasani (Coca-Cola), Epura (PepsiCo), Evian (Danone), Gerolsteiner (Gerolsteiner Brunnen), Minalba (Grupo Edson Queiroz), Nestlé Pure Life (Nestlé), San Pellegrino (Nestlé), and Wahaha (Hangzhou Wahaha Group). Samples came from 19 locations in nine countries on five continents including Brazil, China, India, Indonesia, Kenya, Lebanon, Mexico, Thailand, and the United States. 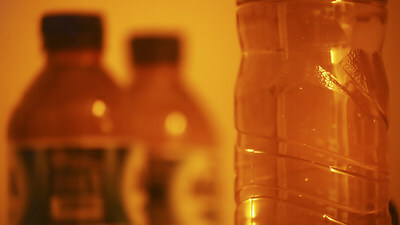 The majority of the samples came in plastic bottles. Water in glass bottles also held microplastic. Orb is pleased to partner with members of the Orb Media Network (OMN), a group of global agenda-setting media which has collaborated to simultaneously publish this story. By working together Orb and the OMN catalyze global dialogue on critical issues, focusing the attention of government, industry, researchers, civil society, and the public. OMN members include the BBC: British Broadcasting Corporation (United Kingdom), Cadena SER- PRISA (Spain), CBC: Canadian Broadcasting Corporation (Canada), Dhaka Tribune (Bangladesh), Deutsche Welle (Germany), Die Zeit (Germany), Folha de São Paulo (Brazil), The Hindu (India), SVT (Sweden), Tempo Media Group (Indonesia), and YLE (Finland). Orb Media is a nonprofit journalism organization that reports on issues that matter to billions of people around the globe. We publish our work simultaneously with a global network of leading media organizations to catalyze global public dialogue to generate citizen-driven change. Fusing original research, data analysis, on-the-ground reporting, and an engaged public, Orb Media produces agenda-setting stories about the challenges we face together as one world. www.orbmedia.org.